Labrador retrievers are wonderful, loving, intelligent dogs. They can do lots of people stuff, like fetch bats for a baseball team. One people skill that they are apparently pretty bad at: driving. 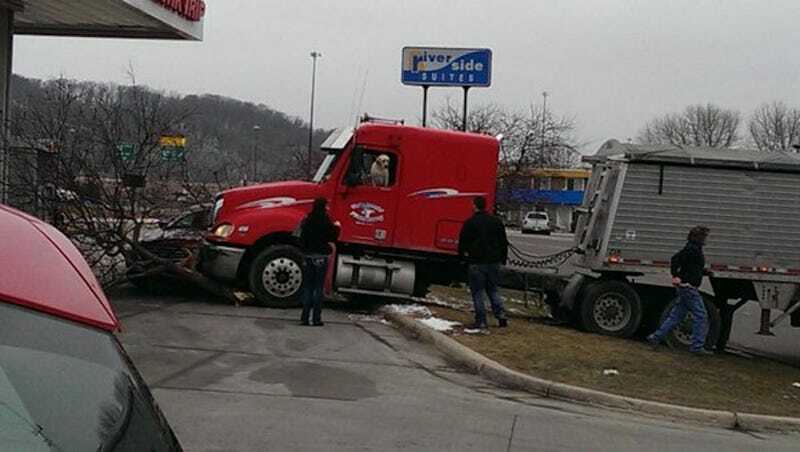 A yellow lab (name currently unknown) up in Mankato, Minnesota apparently took a semi truck for a joyride across North River Drive yesterday afternoon and crashed it into the Kwik Trip gas station. As you can see from the above picture, he didn’t quite park it within the allotted lines. “I heard the tree snap and I thought somebody decided to turn around, but then it just kept going forward,” he said. Stegora didn’t understand how the truck was moving by itself, as he couldn’t see the driver. That changed once the dog climbed up near the driver’s side window. Police Cmdr. Dan Schisel said the State Patrol took an accident report and the truck was taken off the road. It’s unclear whether the truck’s owner, or the dog, will be in the doghouse over the incident. “All I know is it was a Labrador,” Schisel said. This dog probably just saw some videos online of other dogs driving and wanted to be as cool as they are. Can’t fault his ambition.